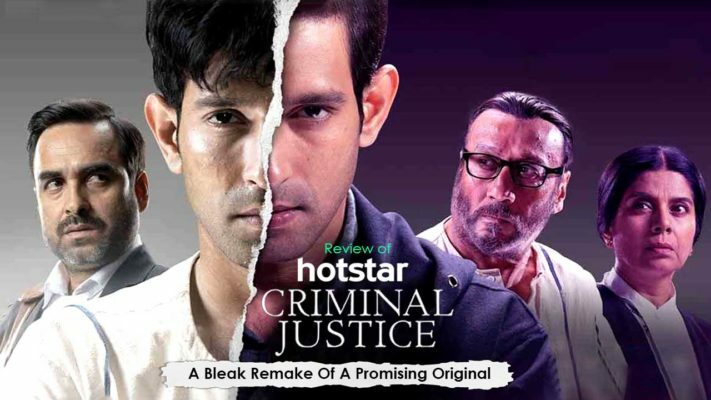 Although the new Hotstar series, Criminal Justice, offers a fair dealing to the metaphorical elucidation it tries to achieve in its title, the series takes off pretty slow. The series is a remake of the BBC original Criminal Justice that had come out in 2008. The BBC version was further adapted as the highly popular American series, The Night Of. The first three episodes start out as a distracting and excruciating version of its original inspiration. Despite a slow start, Hotstar’s Criminal Justice picks up its due pace after about three episodes into the series. The series plays with unanticipated events to bring the best out of its characters and sociopolitical scenario. The audience is finally left with a sense of relief by the end of the series because it ultimately does not fail to deliver. Hotstar’s adaptation of the English original is directed by Vishal Furia and Tigmanshu Dhulia, and written by Sridhar Raghavan. For those unfamiliar with the original storyline, Criminal Justice is a mix of the crime thriller with the courtroom drama. Aditya Sharma (Vikrant Massey) is an MBA college student. Aditya’s family runs a cab business and at times, Aditya helps his family out by driving the cab around for some extra money. One such night, Aditya comes across a passenger by the name Sanaya Rath (Madhurima Roy) who forgets her phone inside his cab. As Aditya returns to Sanaya’s place to give her back her phone, they start connecting. They indulge themselves in drugs and whiskey shots following which the two sleep together. On waking up, Aditya finds a dead Sanaya killed by multiple stabbing. However, he is unable to remember anything from the night before. Once the plot for the murder mystery is set, the series is divided into two classic halves. One-half deals with the criminal trial of Aditya where two lawyers, played by Pankaj Tripathi and Mita Vashisht, strive to prove the innocence of Aditya. The other half focuses on Aditya’s journey of perseverance and survival in the jail and on how a compliant, awkward kid transforms into a fearless and strong badass. Quite an amount of time is dedicated in the beginning of the series to establish normalcy around the life of Aditya. His normal life where he would live and laugh with freedom, spend time with his friends and family –all of these build up a stark contrast to Aditya’s jail life. In the jail, Aditya feels like an outsider and is bullied almost to an extent that it takes him four long episodes to be accustomed to his situation and to the politics that goes on inside. If noticed carefully, there is no surprise regarding the style in which Aditya’s survival story is unfolded. This is perhaps because Sridhar Raghavan is one among the contributing creative forces of the series. In one of Raghavan’s earlier films, Ek Haseena Thi, he had employed a similar style where the protagonist accidentally lands up in the jail and tactically makes her way around a way of life that is radically different from her previous life and finally transforms into a conniving and tough survivalist. Clearly, then, Criminal Justice has to put up with a deficiency in the originality and flexibility of storytelling and treatment. The pace with which the series starts out is not just slow, but monotonous as well. The central premise that the parallel life journeys of Aditya and Madhav (Pankaj Tripathi) only come together to turn one’s second shot at life into the other’s second chance, is made apparent just after the completion of three episodes. However, by that time there’s a lot going on and most of it is to take the plot further instead of supporting a fundamental idea. Vishal Furia and Tigmanshu Dhulia lack distinctive visual imagination and language as directors. Their approach is more clichéd where some bits and parts remind us of scenes in earlier films. To state a case in point, the directors employ the much clichéd scene where when a prisoner enters the jail through a narrow corridor lined by jail compartments on either side, he is jeered at by voices and waving hands of the other jail inmates. While some frames and shots have been splendidly executed, some are excruciatingly banal. Both the directors make liberal utilization of the slow-motion technique in a few important scenes for boosting up the emotional blow, which is, as usual, a hackneyed and irksome trope. The series’ background score is again very common and does not have any hint of a fresh or eclectic theme. Beginning from using melodious music of the Indian instruments to go with moments of emotional intensity to using operatic notes for the climax scenes, the background score has nothing original to offer. The dialogues usually state the obvious as well. For example, in one of the scenes, the camera covers a close shot from a lower angle at Raghu, the investigating officer who by the scene’s end has been able to recognize the murderer and therefore, in a clichéd pointing gesture cries out, “Arrest him!” In short, everything that is in Criminal Justice is done, seen, heard of, and explained. Both Vikrant Massey as Aditya and Pankaj Tripathi as the lawyer, Madhav, do an impressive job as the lead roles. However, the minor characters’ casting appears like a late addition. The minor characters with significant roles include Aditya’s friend inside the jail and Madhav’s psychiatrist whom he sees for treating his skin condition. Criminal Justice is one of those series that drives into parallel tracks and subplots and therefore has the window to exploit the minor characters to add momentum and flavor to the central storyline. However, contrary to expectations, Criminal Justice makes minimal utilization of the minor characters and burdens just the major few characters with the weight of taking the show on. Perhaps, it is Vikrant Massey and Pankaj Tripathi and them only who make Criminal Justice worthy of watching. Massey’s versatile acting capabilities let him glide into Aditya’s shoes effortlessly and turn his journey of transformation through the episodes convincing. Pankaj Tripathi’s character as Madhav starts building itself about halfway into the series. His performance is so natural and believable that the audience connects with him instantly. The audience is able to associate with Madhav’s struggle to bridge his conflict between guilt and idealism. Madhav’s psychological dilemma is underdeveloped even though Tripathi makes the best out of whatever little he is given to work out with. Madhav’s character is intriguing and Tripathi is capable of capturing the essence of his character combining grit, tenderness and cynicism until the end of the series. Jackie Shroff stands on uneven grounds playing the role of the aging gang lord of the prison. Although at the start, his character finds himself too engaged in theatricality, in the latter half, he is more fleshed out and coherent. Mita Vashist is not given many opportunities to demonstrate her acting skills except for using her body language to make a strict and heartless lawyer. Anupriya Goenka’s scenes are mostly played out with Pankaj Tripathi and even though she tries her best to bring out her individuality, her performance is overwhelmed by the singularity of Pankaj Tripathi. Pankaj Saraswat is stereotyped and monotonous in his performance as a truthful police officer. Criminal Justice gets a safe pass because of its lead characters and its storyline. The audience is more engrossed in finding out how the fates of the two unfortunate characters turn out than paying attention to the details. Criminal Justice attempts to play safe by taking a familiar approach towards the treatment of the subject and its ‘Indianisation’. Watch ‘Possibilia' : The Revolutionary Moving Interactive Film From ‘Swiss Army Man’ Directors..! !